In the wake of national crises and sharp shifts in the electorate, new members of Congress march off to Washington full of intense idealism and the desire for instant change—but often lacking in any sense of proportion or patience. This drive for instant political gratification concerned one of the key Founders, James Madison, who accepted the inevitability of majority rule but worried that an inflamed majority might not rule reasonably. 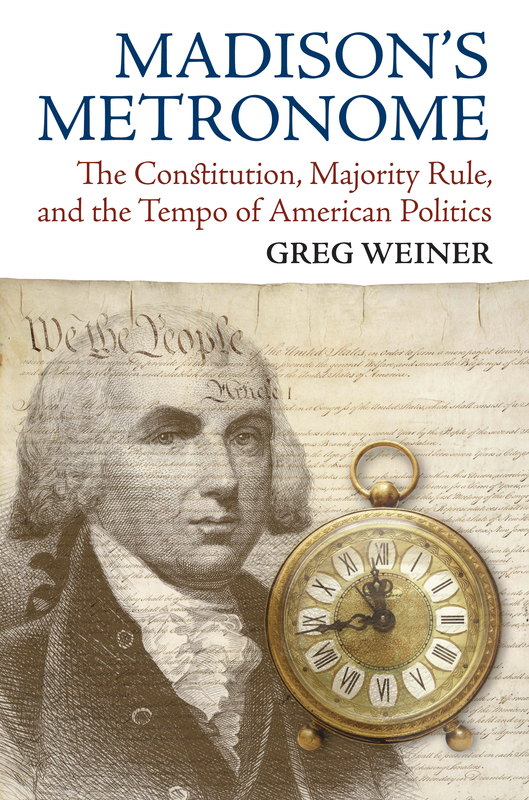 Greg Weiner challenges longstanding suppositions that Madison harbored misgivings about majority rule, arguing instead that he viewed constitutional institutions as delaying mechanisms to postpone decisions until after public passions had cooled and reason took hold. In effect, Madison believed that one of the Constitution's primary functions is to act as a metronome, regulating the tempo of American politics. Weiner calls this implicit doctrine "temporal republicanism" to emphasize both its compatibility with and its contrast to other interpretations of the Founders' thought. Like civic republicanism, the "temporal" variety embodies a set of values—public-spiritedness, respect for the rights of others-broader than the technical device of majority rule. Exploring this fundamental idea of time-seasoned majority rule across the entire range of Madison's long career, Weiner shows that it did not substantially change over the course of his life. He presents Madison's understanding of internal constitutional checks and his famous "extended republic" argument as different and complementary mechanisms for improving majority rule by slowing it down, not blocking it. And he reveals that the changes we see in Madison's views of majority rule arise largely from his evolving beliefs about who, exactly, was behaving impulsively—whether abusive majorities in the 1780s, the Adams regime in the 1790s, the nullifiers in the 1820s. Yet there is no evidence that Madison's underlying beliefs about either majority rule or the distorting and transient nature of passions ever swayed. If patience was a fact of life in Madison's day—a time when communication and travel were slow—it surely is much harder to cultivate in the age of the Internet, 24-hour news, and politics based on instant gratification. While many of today's politicians seem to wed supreme impatience with an avowed devotion to original constitutional principles, Madison's Metronome suggests that one of our nation's great luminaries would likely view that marriage with caution. Greg Weiner has worked in the United States Senate as an aide to three senators and is now assistant professor of political science at Assumption College.